For the sauce: mix maple syrup, chipotle and lime juice, add salt and pepper. Set aside. Heat a large heavy skillet over medium high, add oil. Lightly salt the salmon, place the salmon skin side down first into the pan, turn heat down to medium and fry 5 minutes on each side or until crisp and brown. If you prefer your salmon well done, finish it in a 350F oven for another 5 to 10 minutes. 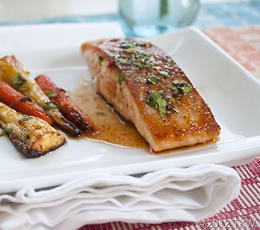 Let the salmon rest 2 minutes prior to serving. Serve with the sauce drizzled over it and garnish with cilantro.